Turns out Hoagland’s “glass worms” were debunked in 2001. I’m glad bara is reading this blog, perhaps he will learn some science. I doubt it. It’s not his MO. Thankfully, that’s not my problem. I apologize for imping Martin Blaise — I should have had the courage to post using my own name. But when you have a fundamentally evil personality like I have, combined with my spectacular ignorance of planetary astronomy, what can you expect? Don’t worry about Bara’s blog post, as usual he’s got all excited and fired off his keyboard without reading. Your blog shows this image as an example of the feature, not a close up of Hoagland’s specific image. It shows that this geological feature is common. If Bara had a brain he’d be dangerous. As it is he’s a simple cretin. There is a HiRISE image of this area, but it’s grainy and doesn’t show the bedforms well (ESP_013137_2190). There are some CTX images (e.g., P18_008166_2177) but they’re slightly lower resolution. It doesn’t matter, I recognize these features as bedforms that appear all over Mars. The definition of a scientist is someone who is willing to change their mind based on sufficient evidence. It’s amazing to me how few people in the world are capable of doing that. People think they can’t be a scientist because they can’t do the math or because they’re not “smart enough”, whatever that means, but that’s not the real reason. It’s the willingness to learn new things, and not be stuck by something that the mind has settled on. It’s a shame it’s not a more common trait. I totally agree with you. I had a great junior high english teacher who once said to the class (back in 1963)…”You should try to learn at least two new things everyday!”. That is so laughable today with the world at our fingertips but it seemed obtainable to a 15 year old then. I read many many articles on science and astronomy related stuff everyday and lack of math skills rarely get in my way. I don’t know why folks get stuck on certain ideas. The only concrete thing that we humans can count on in our lives is change. Don’t you think that pseudoscientists have a psychological need to appear to have “the true factual story” ? Obviously some of them are in it for the money, but others must find it an easier path to getting attention and followers. Whatever the reason, I find the trend rather alarming. Thanks for the time you give to these posts. Just FYI, Arthur C. Clarke is the one who referred to them as “Worms,” Hoagland always maintained the image was of a possible transportation tube, and only referenced Clarke’s notion by calling them “worms.” Also just FYI, a geologist with 25 years of field experience and a Yale educated Ph.D. astronomer agreed with Hoagland’s interpretation. Also, just FYI, this isn’t even a picture of the same object. In fact, it’s not even the same area of Mars. Not even close. No, it’s not the same place. But it’s the same type of feature: a narrow valley filled by aeolian bedforms oriented transverse to the valley walls. I could track down the original site and see if there’s a HiRISE image there, if it would help. It wouldn’t change anything, though. As for the interpretation of worms vs. transportation tubes, well, they’re both wrong, regardless of decades of experience and degrees from prestigious institutions. But don’t let the scientific method get in your way. haha… Doc, Your sign-off “Cheers” seems to be dripping with sarcasm! It’s not the same feature at all. These are out in the open, the “Glass Tubes” are in a deep crevasse. I can’t argue with someone who can’t be convinced by evidence. There’s really no point. We’d just go back and forth and never get anywhere. I don’t know about you, but I have demands on my time, and I’m sure we’d both be more constructive doing something else. Take a geology class or three (or fifteen), do some field work, read some of the scientific literature, and when you’re willing to put forth a constructive idea, we’ll talk. Translation: I’m losing the rhetorical battle on the facts so now I’m going to retreat behind the old “I’m a scientist and you’re not” canard. Sorry. I must have misinterpreted your ad hominem attack, misleading prose, incorrect attribution and fallacious photographic comparison for a “constructive idea” or “evidence.” I guess it constitutes a definition of the “scientific method” I was just not previously aware of. Thanks for educating me. PS – I think I’ll rely on the interpretations of a professional geologist with 25 years of field experience and Yale astronomer rather than your biased and indefensible perspective. Or I can just use my own eyes. But thanks for sharing! I see. You’ll rely on the interpretations of others rather than do the work and get that experience yourself. Well, I suppose it is easier that way. Very interesting article Lori. Thank you for that. You should be aware however that Richard C. Hoagland has never admitted to being wrong about anything. Ever. Even when presented with irrefutable proof Hoagland will still maintain he is correct, and that the person debunking him is a paid NASA shill or in the employ of some other alphabet soup agency who are trying to keep him from getting the truth out. He has a vested interest of course. He has been selling pseudoscience to the gullible for over 30 years now. If he admits to making even a single mistake then the walls could come crashing down and he might have to find a real job. Expat has all the goods on Hoagland and Bara’s utter nonsense on The Emoluments of Mars blog. The difference between scientists and pseudoscientists is that scientists will change their view if presented with irrefutable evidence, even if we do so reluctantly (it hurts to be wrong, but reality is what it is). Thanks for an amazing blog which I discovered by accident thanks to ‘likeing’ SETI on FB…glad I did! I am somewhat in awe of you for working on these Martian images & I am promising myself to stay tuned to your blog….you are working on the real deal!! At the time of writing this comment I am sitting in front of a bank of monitors, on an oilfield construction/survey vessel which has one of it’s ROVs rolling along a pipeline that was recently laid. We started at about 1800m depth & will work our way in to about half that depth. My time is spent ensuring the data is good & staring at three cameras showing real time images from the seabed. 99% boring but every so often you see some wildlife that makes you go ‘Wow!’ I wonder if your job is maybe a little bit similar, but vastly more interesting!! Here’s a link to Jim Elder’s webpage on how bedforms are created. He studies what I consider “dead dunes”, the sandstones that are composed of the interiors of what were once dunes, millions of years ago. To be able to decipher those things you really have to understand the process. He makes it seem simple, as in his movies the wind only blows from one direction. It get complicated in real life, where the wind is never constant in direction or strength, so you can get all sorts of interesting patterns both inside the dunes and in the outside structures. I tend to focus on the outside, since that’s what we typically see from spacecraft images of Mars. But sometimes we can peek into the inside of an old dune or ripple on Mars, when it’s eroded enough or cut by an impact crater, allowing us to see what’s inside. Thanks for the info Lori…I read Jim Elder’s info & it took me back to my school days of geology 101! I’m guessing then that for the ripples to be formed in that way then there must be some significant channeling of wind, & the wind direction must be relatively consistent regards direction. Either way it is an amazing image! Yep, and in fact a large part of what I do for a living is to use the orientations of dunes and ripples to figure out what the prevailing winds on Mars are. Without a global network of meteorological stations, they are sometimes the best clues we have to what the winds are doing (and once did, if the dunes and ripples are old). Glad you enjoyed it! Regards the surface winds, are you able to say what support is in place for a any sort of early weather warning for the ‘machinery’ on the surface? I would imagine that some of the vehicles down there are relatively delicate & would be in trouble in some of the high winds that I understand are encountered. They are pretty study bots. Opportunity has been trolling around since 2004. It’s been through major dust storms and didn’t blink. It’s crawling across terrain we know has active sand blowing across it. Sand grains have been found on the rover deck, and as far as I know haven’t caused any damage. The biggest problem is that accumulation of dust on the solar panels reduces power, but every so often the wind blows most of it off (and that’s a good thing or we’d have lost touch with it years ago). Curiosity doesn’t have any solar panels to worry about, and as far as I know there have been no issues with either sand or dust. When it passes through the dark dune field on its way to Mt. Sharp, it may experience some real sandblasting, but when we tried to talk to the engineers about it they shrugged and didn’t seem concerned. So hopefully they’re right to not be worried. For some reason people have the impression that winds on Mars are crazy strong. That’s not generally the case. Every anemometer we’ve sent to Mars has reported winds too low to move sand, which led researchers to generalize (for years!!) that Mars was not as windy as originally thought. I knew that couldn’t be the case, since dune fields and dark surfaces are regularly cleaned free of bright dust, which settles out of the atmosphere after dust storms. It wasn’t until the mid 2000s that we discovered many of the dark dunes on Mars are actively migrating, so the wind must be strong enough to blow sand at least some of the time. Like Earth, Mars has different wind patterns in different locations, so you can’t judge data from a couple of lonely instruments and generalize to the whole planet (one data point is infinitely better than none, but you can’t extrapolate a trend from it, and yet that’s what people were doing — one of my pet peeves…). Hi Lori, I’d like something cleared up if you will. If those ripples were made by the wind, why do we only see them in that straight channel? Are you saying that a dust devil caused the channel and the ridges? If so, do dust devils usually travel in a straight line? We have dust devils here on Earth, but do they make channels like those seen here? Even tornadoes don’t leave channels that deep. Can you explain also just what kind of power these dust devils have in able to cause such deep channels? There are a lot of unanswered questions, like what caused that straight channel if it wasn’t a dust devil, and if it wasn’t a dust devil why do we see ridges only in the channel and nowhere else in the surrounding landscape? Thank you. 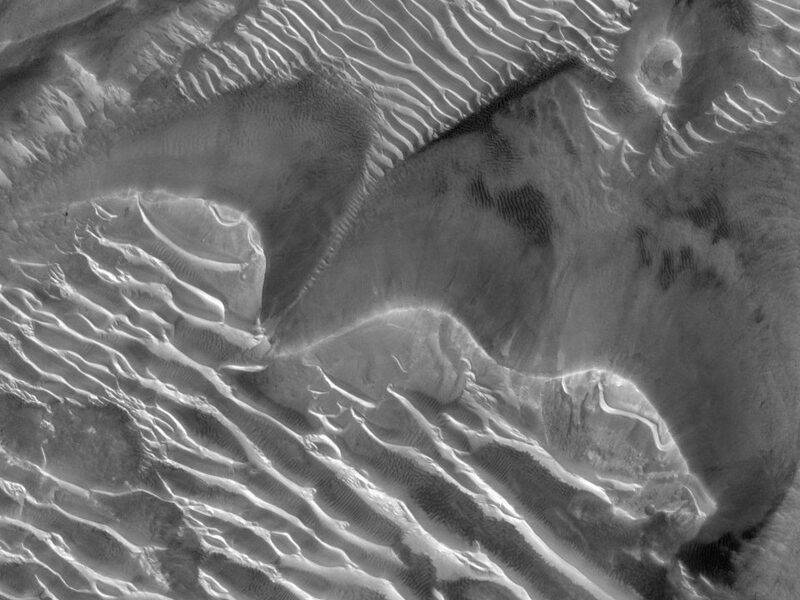 Ripples and dunes tend to form in low-lying spaces. Sediment gets transported along plains but it gets stuck in the holes (You can try this at home: dump some sand or flour on a bumpy surface, spread it out with your hands, and see where bits of it get stuck. This in fact is why I don’t like my tiled countertop, because dirt gets stuck in the cracks and that makes for more scrubbing to keep it clean.) 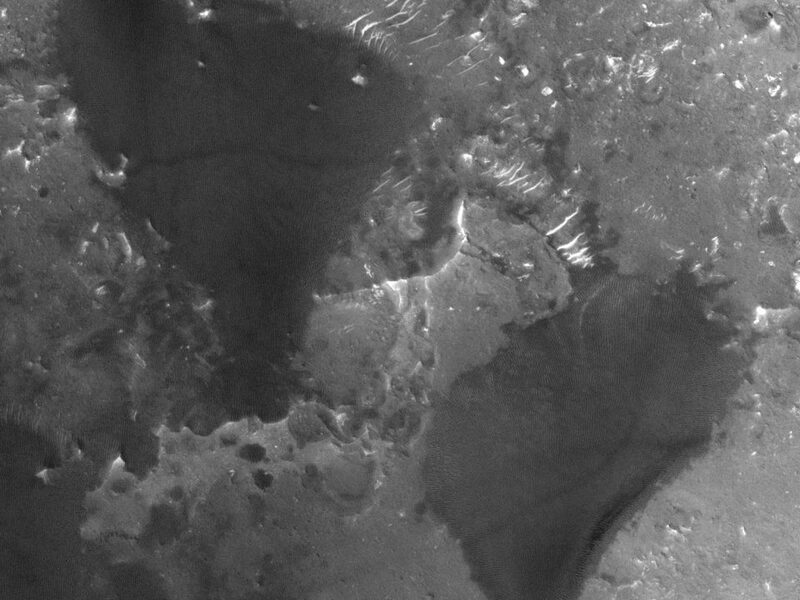 If you go to the HiRISE webpage for this image, you can see the whole image (click on the JPEG Grayscale map projected link). You’ll see that ripples don’t just form in this channel — you’ll see them in nearby craters and low-lying areas on the surrounding plains. I doubt a dust devil created this channel. Dust devils tend to only pick up a small amount of material (fractions of a millimeter) and this channel is probably several meters deep. Dust devils also don’t leave ripples behind, they just don’t have enough power or coherent wind direction to produce bedforms of this size. More likely the channel is a tectonically-formed crack (although to be sure, I’d have to find someone who has mapped the geology of this area and ask what they thought formed the channel). So the channel formed first, and then later, wind blew sand (and maybe dust and coarser grains) along the plains, which got stuck in the channel and developed into ripples. “These ripples form a class of bedform that are unlike anything we see on Earth”? Aren’t you making an assumption that these “ripples” are naturally-formed? Why couldn’t they potentially be an accumulated & piled-up combination of materials on top of artificially-created (but unseen BENEATH) objects or structures of some kind? Perhaps this is a somewhat visually similar to here on Earth when snow piles up on top of those lined-up cement parking barriers in a parking lot. Bedform, by the way, is a geological term for an accumulation of loose material that loses material to erosion on one side while accumulating material on the lee side. Usually they’re formed by wind or water moving the loose material around. Dunes and ripples are types of bedforms. On what the bedforms are sitting on: We see what the ripples are superimposed on fairly well. They sit on top of crater ejecta, on crater floors, on plains between craters, in river channels, and in grabens. Of course you can’t see the little part that the ripples are actually sitting on, but they’re small, and you can see all of the surrounding terrain. Nowhere on the surrounding terrain is there any sign of artificial structures, save for the occasional nearby rover and bits that fell off during its descent. On the bedforms themselves: Curiosity will visit some ripples like these on its way up to Mt. Sharp, so perhaps this question will be put to a final rest in the next year or so (so stay tuned…). But here’s my thinking. These features have all the morphological characteristics of aeolian bedforms of some kind. They form in topographic lows, just like dunes and ripples do. They are often associated with dark dunes, and are likely formed from material that isn’t mobile enough to add to the dunes (but is still capable of forming a bedform). There are places where I’m mapping in Meridiani Planum where the same type of bedform seems to merge with features that Opportunity has definitively shown are what we call “coarse-grained ripples”, a type of bedform. The upwind sides of these features often seem to have exposed interior bedding planes, just like dunes and ripples do, suggesting they migrate across the surface in a similar manner as dunes and ripples. 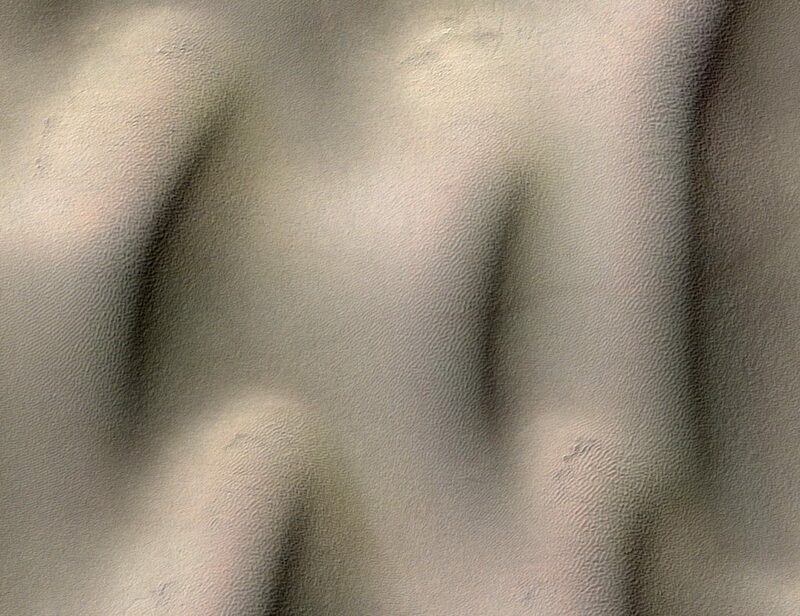 Given how common dunes and ripples are on Mars, there’s no reason not to think that these features are also some sort of bedform. On not believing in artificial structures or life: NASA is hurting for money, as are all planetary scientists (except for the occasional tenured prof), and we would let you know if we found signs of life or artificial structures. If you only knew how we struggle for enough funding to pay the mortgage, you’d understand. That would be the ultimate job security for any scientist, and I promise you if someone ever finds something like that, nobody will be able to shut them up. I can only speak for myself, of course. But even if NASA or whoever managed to find a way to shut me up, then nothing would stop the next scientist or the one after that (that’s just how science works). Who might be looking at data from a satellite funded by ESA. And in the coming years, maybe those satellites will be privately funded, or come from Japan or China, that is, some place without a US agenda. Who outside the US wouldn’t love to take NASA down a notch by being the first to prove there are signs of life beyond Earth? If it’s there, you’ll hear about it. And I’ll breathe a sigh of relief, knowing that suddenly money for Mars research will come out of the woodworks, and that maybe I’ll even get to fulfill my personal goal of walking on Mars. If only. Yuck…Millipede was my first thought! Hi, Actually have a couple questions on your latest two posts. A. Are these images stereoscopic?? When i click for larger format hi-res, i feel like i s/b wearing those funky 3D red and blue lenses? B. Are these true or false color images of the martian landscape? c. Crest’s of ripples seem brighter is that because they are covered in frost or ice? A. Nope. 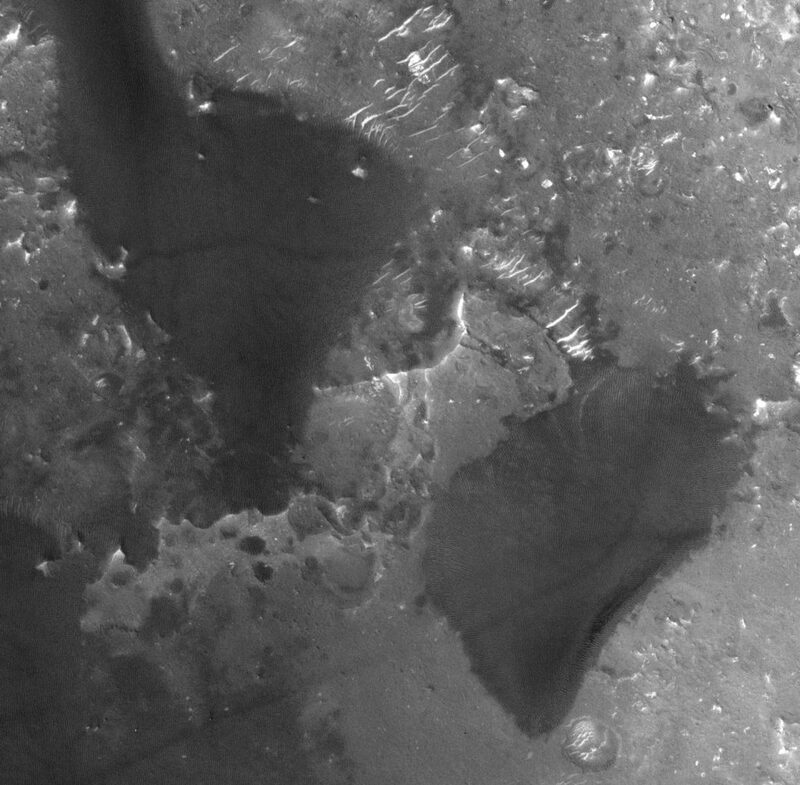 Some HiRISE images have repeat coverage, and stereo images have been made from them. But these are all single images. I suppose a nice stereo image would provide further evidence that Hoagland’s idea was wrong. B. They’re false color. 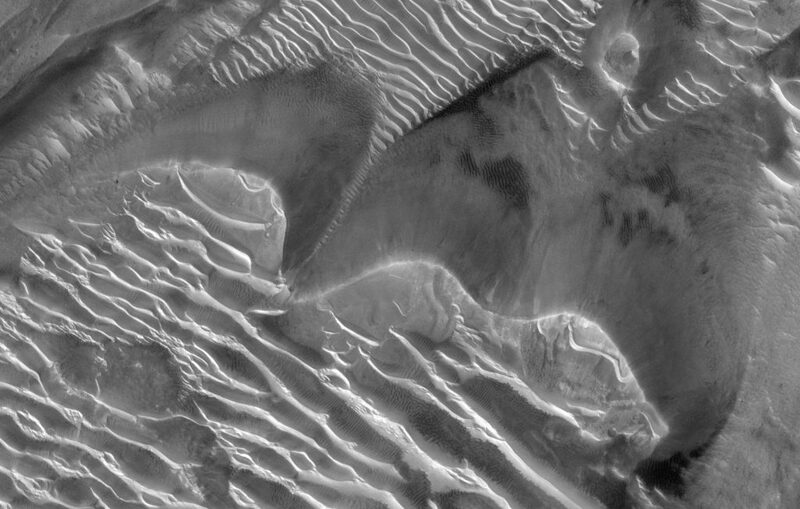 HiRISE has different color channels, and these images are made from the infrared, red, and blue channels assigned to red, green, and blue colors. So it’s sort-of-kind-of-like-colors-you-might-expect, but not entirely. Not as bad as radar images mapped to RGB colors. But not exactly what your eyes would see if you were in orbit peering down at the surface, either. C. These are pretty weird ripples. They’re not covered in frost. There are two tones of material showing: the bright stuff that looks like frost, and the bluish-gray stuff. They seem to vaguely form lines parallel to the ripple crests, which suggests they might be exposed strata internal to the ripples. I’ve seen that sort of thing shown better in other images, which is why I think that’s what it is. But why two tones? I don’t know. These ripples form a class of bedform that are unlike anything we see on Earth. 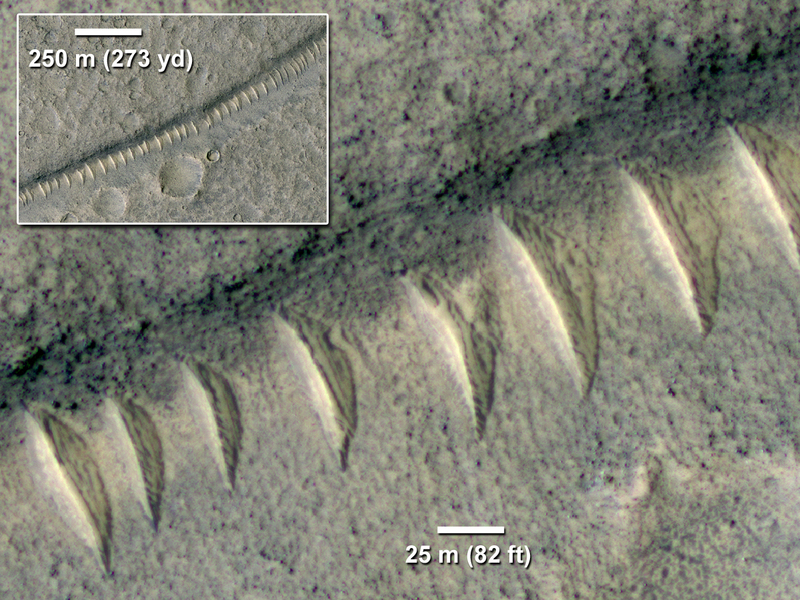 They have a morphology similar to ripples, but they’re as large as small dunes. We call them “TARs” (transverse aeolian ridges), which is a descriptive but otherwise not very helpful term for them, because we don’t have a better word for them. Curiosity will hopefully pass by some feature like these on its way up Mt. Sharp, and maybe then we’ll finally get a chance to figure out what they are. Viewed interesting images from Curiosity today regarding a night-time drilling into i think was a sandstone outcropping called “Winjana”and the material it uncovered looks amazingly similar to the blue-gray strata in your”TARs” could this be the same bedform material? They could be similar. I think the Winjana sediments may have been formed underwater — I’ll have to check on that though. But they could be made out of similar material.